Download the latest PDF version. The Roundhouse renovation project is entering the design development phase after a presentation of schematic drawings met with informal approval at Monday’s Board meeting. Joe Benesh and Phil Hodgin from RDG, the architectural firm handing the Roundhouse project, presented schematic drawings of both phases of the project, as well as artistic renderings of the completed facility. In order to create the schematic designs, RDG held focus groups with students, teachers, maintenance staff, and others who utilize the facility. They worked with the Design Advisory Committee, comprised of community members, Board members and district administration, to come up with a design to meet the community needs. “We’ve distilled everything we’ve heard and everything we’ve learned into some design options,” Benesh said. Benesh and Hogdin also stressed they want to preserve the iconic nature of the Roundhouse, will adding and enhancing it to create an impressive landmark. “Your guests will be impressed and intimidated and you’ll be proud,” Hodgin said. The School Board has committed $9.1 million toward the project, which will include new entrances, Hall of Pride, concessions, restrooms, locker rooms, weight room, roof, floor, bleachers, and a lot of mechanical and HVAC upgrades. A second phase, which would add a new wrestling room and auxiliary gym, will cost an additional $3.7 million and is contingent on community fundraising. The project now enters the design development phase, where more detailed drawings are created. This phase should be completed around April 1 RDG says, at which time it will come to the Board for approval in order to begin working on blueprints and specifications. Representatives from the Department of Education spent three days in the district last week as part of a required Comprehensive School Improvement Visit. Though their formal report will not be available for 60 days, they gave informal feedback to district administration Thursday, Jan. 17. The Site Visit team was impressed with the progress seen since the last visit five years ago, noting a consistent understand of the district mission, vision and goals across different groups. The Site Visit team interviewed teachers, administrators, support staff, parents and students as part of the process, and noted there was a strong sense of partnership and collaboration. Team members were particularly impressed with the community Not In Our Town initiative, and said one of the highlights was their time interviewing Marshalltown High School students. The Site Visit also included a document review of everything from Board Policy to personnel files. The district received three notes of noncompliance, which Superintendent Marvin Wade noted were all easily fixed. Two included changing language in Board Policy, which the Board began addressing during Monday’s meeting. The third was a missing evaluation in a personnel file, which will also soon be corrected. Dr. Wade and Dr. Susan Pecinovksy, associate superintendent for student achievement, noted the hard work of everyone in the district for continuing to focus on improving student achievement. Digital literacy is an important skill for students to find success in the 21st Century. Through the help of learning.com, Marshalltown students will soon find these skills integrated into their regular classroom instruction. Ronnie Manis, district instructional applications specialist, and Chris Niemeyer from learning.com gave an overview of their services to integrate digital literacy education into core instruction. Instead of adding new curriculum, learning.com adds technical skills components to current instruction, from keyboarding and word processing to online safety. The goal is to increase the digital literacy of students, preparing them for the demands of school and work in the 21st Century. The district is still working on the details of how this will be rolled out across schools and integrated with different subject areas. Tyler Kluver at the ceremony to receive his game jersey last fall. This evening we were reminded that once in a while, life gives us an experience that can grow us beyond our expectations. 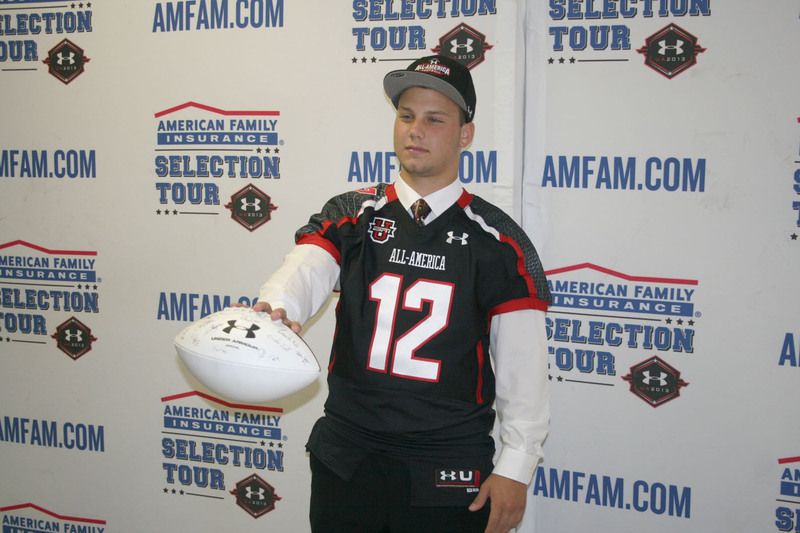 MHS senior Tyler Kluver spoke concerning his recent experience while playing in the 2013 Under Armor All-American High School Football Game. It was obvious that Tyler has worked diligently to develop his athletic skills and talents that took him to this venue. He is an example of what dedication, hard work, sacrifice, and determination can accomplish when we set our goals at a high level and then work to achieve our goals. It is our role as parents, educators, counselors, coaches, administrators and mentors to help our students succeed in athletics, scholarship and life. We are extremely proud of Tyler and his accomplishments. We know he will represent us well as he moves into college and through his adult life. Thank you for reminding us as Board members what we can achieve when we put forth enough effort to reach our goals. Expectations for student use of technology now far exceed merely being able to use a desktop computer. Twenty-first century students must be “digitally literate” – able to locate, use, summarize, evaluate, create and communicate information while using a variety of digital devices. Tonight’s presentation on Digital Literacy focused on the district’s commitment to strengthen our curriculum in this important area. Future presentations will be devoted to infrastructure, policies, devices and support materials consistent with our technology vision of promoting innovative practices that prepare students for success in an ever-changing global society. 401.4 Employee complaints, approve as amended, waive second reading. 401.10/R – Credit Cards, mark reviewed. 401.11 – Travel Allowance, mark reviewed. 401.12/R – Employee Use of Cell Phones, mark reviewed. 600.1 – Nondiscrimination, change language according to the recommendation of the Site Visit Team, bring back for first reading. 603.12 – Internet – Appropriate and Safe Use, change language according to the recommendation of the Site Visit Team, bring back for first reading. A community-wide kickoff for “Spread the Words – Read by Third” is planned for Wednesday, Jan. 16, 5-6:30pm at the Marshalltown Public Library. Marshalltown was designated an All-America City for its work on the Spread the Words initiative, selected out of 160 communities applying for the distinction. Work focuses on three areas connected to literacy: chronic absenteeism, summer learning loss and school readiness. Task forces worked in the late summer and early fall to develop action plans focused on the three areas, aligning goals and strategies to the District Strategic Action Plan. “Our work has just begun,” said Sue Martin, one of the cochairs of the Spread the Words initiate and former director of the Martha-Ellen Tye Foundation. Martin, along with Mid-Iowa Community Action director Arlene McAtee, told the Board about some of the pilot projects and upcoming projects geared toward having 90 percent of third graders proficient in reading by 2016. Twenty middle school students will participate in a Kid Career Academy next summer, facilitated by members of the Marshalltown Police Department. Kraig Langeschulte, school resource officer at Marshalltown High School, and Brad Mauseth, MPD community outreach officer, told the Board about their proposed program, which will run July 8-26, 2013, in the Community Y Cultural Center. The program will work with at-risk youth and focus on character education, police education, physical fitness, leadership and community service. Participants will have guest speakers from different aspects of local law enforcement, including a look at the K9 unit, crime scene investigation, and the Marshalltown Fire Department. There will also be activities about bullying, character building, and leadership. Each day will also include physical fitness activities and a time for writing and reflection. Meals will be provided through the Marshalltown Schools Summer Meal Program. At the end of the program students will have a celebration and graduation ceremony with a family potluck and five special awards given out for the five focus areas. The cost of the program is $4,000, which Langeschulte and Mauseth hope to fund with grants so there is no cost to the students and their families. District staff and administrators have been working hard to create a comprehensive, well-defined continuum of services for students, as well as a framework for accessing services. The work has resulted in a common vocabulary and understanding of services in the Response to Instruction and Intervention (RTI2) process. Pecinovsky said previously a lot of the same work was going on around the district, but under different names, with each building having its own labels for teams and processes. Now there are common names and a common understanding across the district, with data teams monitoring the RTI2 process. The continuum of services has been defined by three areas: universal, targeted and intensive. The goal is for 80 percent of students to have their needs met by services in the “universal” area, which includes work like the Language Literacy Framework, Positive Behavior Intervention Supports and using data to inform instruction. “It’s going to take time and the resources will shift as the universal gets stronger,” Pecinovsky said. The final early retirements were approved at Monday’s Board meeting, bringing the total to 31 for 2012-2013. Tim Bell, MHS athletic director, 35 years. Marsha Eppert, MHS Special Education, 21 years. Molly Ferrin, MHS Special Education, 21 years. Mary Fitzgerald, Miller 7/8 Language Arts/Reading/At-Risk, 35 years. Carolyn Hanchak, MHS Special Education, 31 years. Catherine Hansen, MHS Special Education, 25 years. Julie Harvey, Hoglan Grade 2, 30 years. Shirley Mann, Franklin Grade 3, 35 years. Peggy Niedermann, Lenihan Grade 5/6, 15 years. Sally Robertson, Hoglan School Nurse, 18 years. Paula Rutherford, Fisher School Nurse, 23.5 years. Nancy Van Wyk, Franklin Grade 4, 38.5 years. Ellen Youds, Rogers Media Specialist, 32 years. Val Strong, MHS 12-Month Secretary, 32 years. Brenda Walkup, Rogers 12-Month Secretary, 33 years. Tonight we had the final numbers presented for those long term district employees choosing the early retirement package for this year. We had 31 employees with 791 years of experience with the district elect retirement. We wish them well on the next adventures in their lives and careers whatever they may be. We deeply express our gratitude for the lives these educators have touched through the years and know they have added so much to so many. We will greatly miss your experience and devotion to our district, the community, and mainly our children. Thank you for your service and dedication. The early retirement program accomplished several goals and we estimate (with many assumptions I might add) that the district will save about $600,000 assuming all of the positions are filled for next year. This makes a big dent in the budget shortfall of $1 million that we are projecting for 2013-2014. We will need to monitor our budget projections while we negotiate contracts with those employee groups that are on single year contracts over the next few weeks and months. We then will determine where additional cuts can be taken to keep our expenses in line with our income. Since salaries are the major piece of our budget at about 70 percent, those costs will have the largest effect on the costs projected for next year. Thank you for your continued support and dedication to our district. 401.1 Equal Employment Opportunity, update language to say we will conduct a background check before all employments, update to reflect Matt Tullis as equity coordinator, waive second reading.